La Liga have announced the official Team Of The Season for the 2014/2015 campaign featuring Six FC Barcelona players with Luis Enrique also scooping the Manager Of The Year award. Claudio Bravo featured in goal while three Barca defenders made the cut in the back four. Dani Alves was featured at right-back with Valencia’s Nicolas Otamendi pairing at Central defence with Gerard Pique. The left back position was taken by Jordi Alba who had a great season. 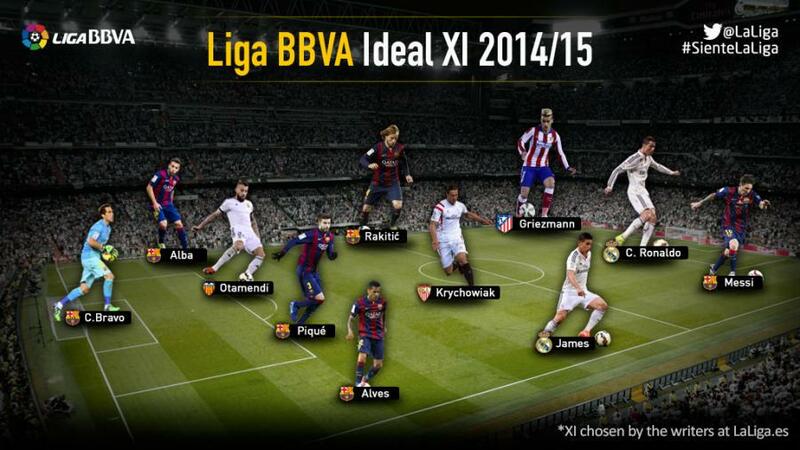 In midfield, Ivan Rakitic was joined by Real Madrid’s James Rodriguez and Sevilla’s Krychowiak. The front three wasn’t much of a surprise except for the exclusion of both Neymar and Luis Suarez as Atleti’s Antoinne Griezmann was preferred instead. He is joined by the great two, Cristiano Ronaldo and Lionel Messi. Luis Enrique also unsurprisingly won the Coach of the Year award. – Goalkeeper: Claudio Bravo (Barcelona). – Defenders: Dani Alves (Barcelona), Nicolás Otamendi (Valencia), Gerard Piqué (Barcelona), Jordi Alba (Barcelona). – Midfielders: Grzegorz Krychowiak (Sevilla), Ivan Rakitic (Barcelona), James Rodríguez (Real Madrid).